I haven't been posting lately as we have been enjoying a 'Goldener Oktober (yes I know, it's still September) here in southern Germany and I couldn't justify staying indoors in such great weather. My craft room is in the keller and nice and cool it is too, but we know that soon the temp will change and we will be shovelling snow soon enough! So we enjoy the sun for as long as we can. Today's post is for the current Get Funky! challenge over at the Funky Hand website. Anice from Funky Hand provides a freebie backing paper to use with each challenge for participants who do not have Funky Hand papers. At least one Funky Hand product must be used in order for your entry to be valid. For previous submissions I have been using my CD 'The Funky One' but I thought I make a change and use the free paper for this challenge instead. The green ribbon, gems and pink paper are also from my stash and I die-cut the pink paper with a Tim Holtz Alterations edging die to add a bit of detail. Thanks for stopping by and don't forget to leave me a comment. 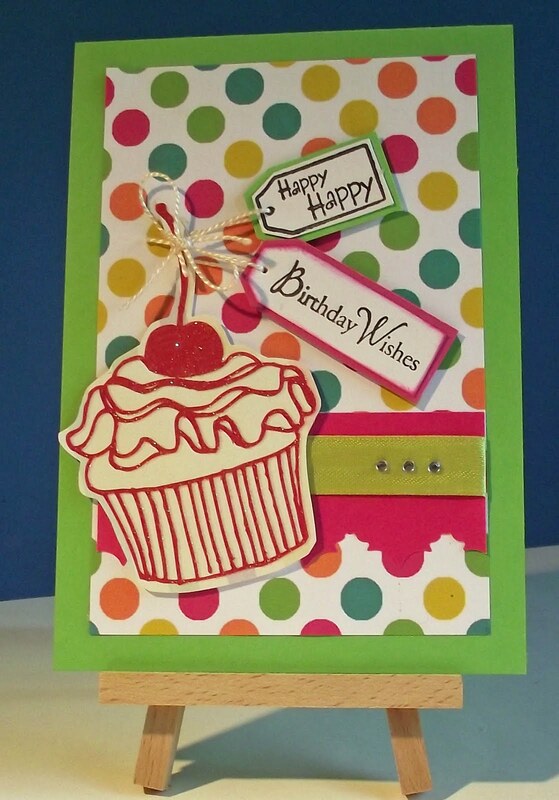 This is a wonderful card, I love the cupcake. I'm glad you have enjoyed using the Funky Freebie paper for this months Get Funky challenge and thank you very much for joining in. this is just gorgeous hun, i love how you used the freebie and that cake looks yummo!!! OOhh! I love how bright this is and the green cardstock really sets it all off! Thanks for entering the Get Funky! 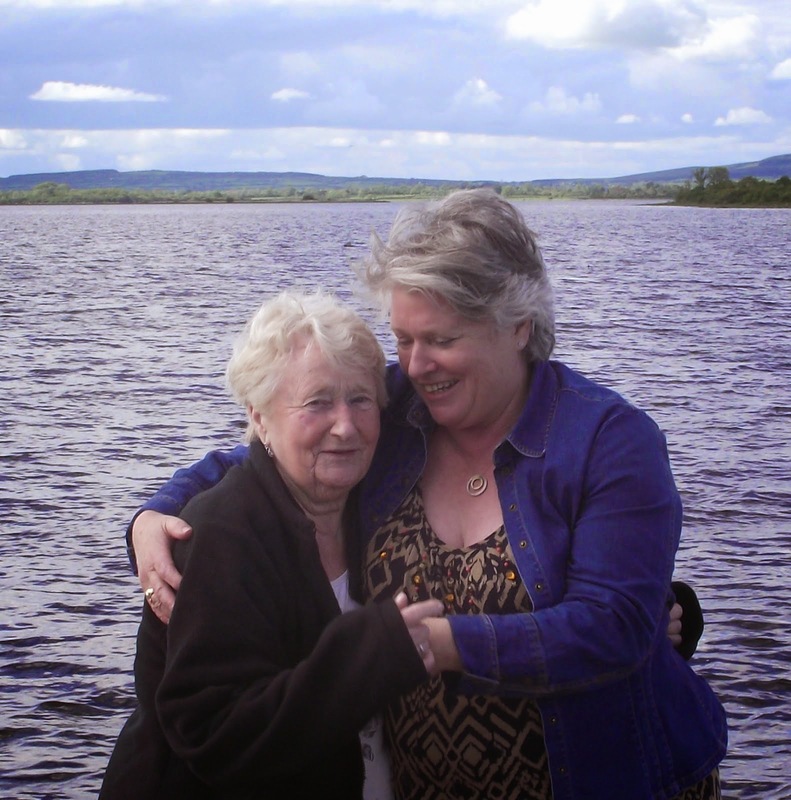 Challenge – hope you can join us again next time on the Funky Fifteenth! Get Funky! Great use of Anice's Freebie this month. Love your cupcake too and those lovely sentiment tags!! WOW - this is such a cheerful card Angela. I love it and love the story about the wrapping paper!!! A fab use of that wonderful freebie too. Gorgeous card! 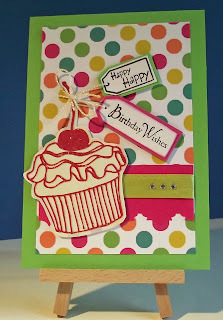 Lovely layout and fab little cupcake! Thanks so much for joining in the Get Funky challenge!